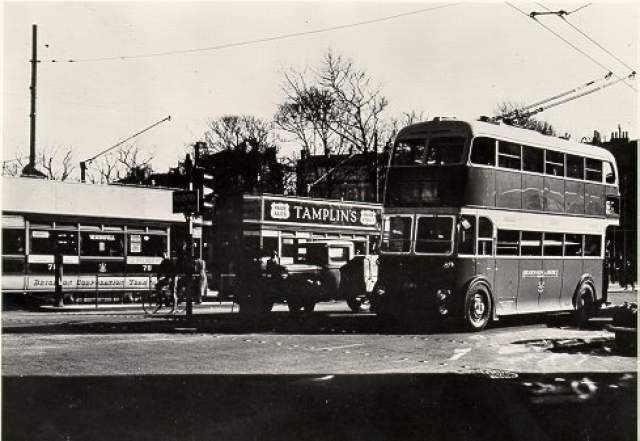 Trams and Trolley Buses, 1939: Trams and trolley buses at the terminus in the Steine just after the introduction of trolley buses and prior to the trams being phased out. 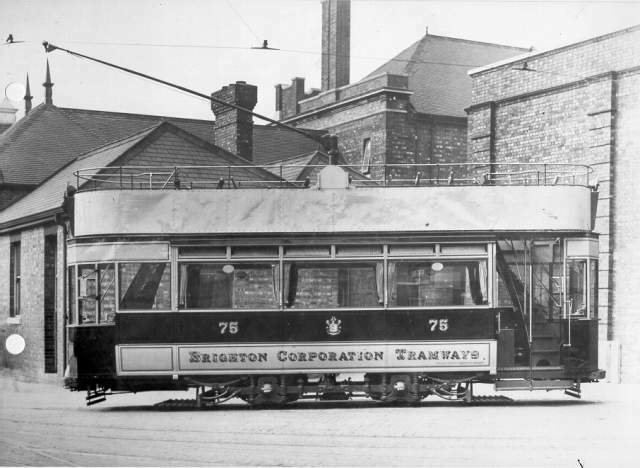 b) TRAM-CARS AND TRACK: Fifty cars were initially purchased for the system, and 116 replacements were built over the years at the corporation’s tramway depot in Lewes Road . All were four-wheeled, open-top, double-decker vehicles in a burgundy-and-cream livery, operating from trolley wires at 550 volts d.c. with 40-50 b.h.p. engines. The cars, several of which were illuminated with coloured bulbs, were six feet wide, nearly thirty feet long, and ran on a gauge of three feet six inches. (A model of a Brighton tram-car may be found in the town museum .) The tracks were laid in the centres of the roadways, and the road surface was then laid with wooden blocks to bring it up to the same level. Tram stops were marked by studs in the middle of the road. CLOSURE: The increasing suburban development of the 1930s, combined with the lack of flexibility of the tramway system, prompted the corporation to opt for a new network of both trolley- and motor-buses. 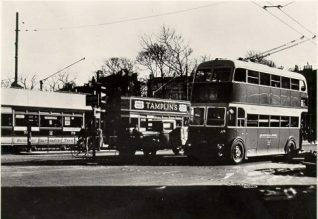 Tram routes were consequently withdrawn and replaced by buses from 26 April 1939 until the last Brighton tram ran from Upper Rock Gardens to the Old Steine at 2 a.m. on 1 September 1939, bringing to an end thirty-eight years of almost accident-free service. An estimated 52 million miles had been run, 629 million passengers carried, and a profit of £54,000 made by the Brighton trams. Most of the Brighton tram-cars were scrapped for the war effort, but one does survive; no.53, dating from 1937, was discovered on a Partridge Green pig farm and awaits restoration. The other main relics of the tramways are the shelters in Ditchling Road ( Florence Place ), Queen’s Park Road ( Pepper-Box ), and Dyke Road (reservoir); another has been used for the Aquarium Station of Volk’s Railway , one may be found at the Stanmer Rural Museum, and two more have been removed to the Chalkpits Museum at Amberley. The tramway depot in Lewes Road is now the depot of Brighton Buses, but it retains windows etched with the words ‘Brighton Corporation Tramways’. At the corner of Dyke Road and the Upper Drive is a standard that formerly supported the tram supply wires; it bears the initials ‘BCT’ and the borough arms. My great grandfather must have been one of the unlucky ones, and they say that chimney sweeps are lucky! Taken from A2A archive “William Wadey of 7 Circus Street, Brighton, retired chimney sweep; 71; at the Royal Sussex County Hospital; whilst crossing York Place on 30 Nov he was knocked down by a motor car which threw him in front of a tramway car whereby he sustained multiple injuries in consequence of which he died from bronchial pneumonia; accidental death”. 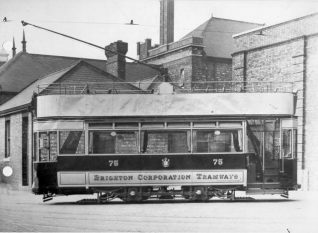 The date on the picture of Brighton tram no. 75 is not correct. No.75 was an “E” class tram, of which 13 were built between 1929 and 1931. The picture was apparently taken when the car was brand new, as there are not yet any advertisements on the sides, so the correct date for the picture is ca. 1931.